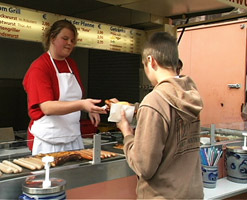 Buying a hotdog at the market - "Was kostet das?" This section introduces the higher numbers 40 - 500 and shopping with Euro notes and coins. Pupils will be able to ask prices and understand sums of money in Euros, as well as do sums in German. We see German children shopping at the market - pupils can use the vocabulary they learn to perform role-plays and practise buying things in a 'class shop'. - you can spend them in any EURO country. We looked everywhere for a source of EURO play money you could use for your class activities to get children used to handling EUROs - now we've found it! See here for details of group sets and class quantities of authentic-looking EURO notes and coins play-money.